What makes the Spirit stand out from many other recurve bows out there, and even those that are created by the same company is how versatile and adaptable to any shooter’s level and style it can be. Made by a company with a good standing tradition in making bows for hunting and target practice, the Southland Archery Supply SAS Spirit might be precisely what you’re missing to either take your game to the next level or take up archery as a hobby. 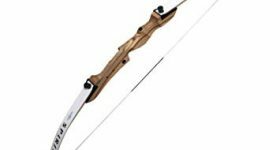 This recurve bow is pretty much what you would expect from a product in this price range. Nonetheless, that doesn’t mean that it doesn’t offer excellent value for the money. For starters, the limbs are made from maple with laminations of fiberglass for increased durability. The number one reason why the Spirit is a good option for a beginner is the flexibility of its limbs. You can draw and shoot to your heart’s content, as these limbs will not break. Durability means that you get a good deal if you’re planning to use the recurve bow quite a lot. The manufacturer even goes as far as to say that you may try to break this bow, but you won’t be able to do it, at least, not easily. Being a model that caters to young archers, it is suitable for shooters that are up to six feet in height. But that’s the only requirement that you should know about. Chuglam, Gmelina arborea, and beech are the names of the woods used for the riser. 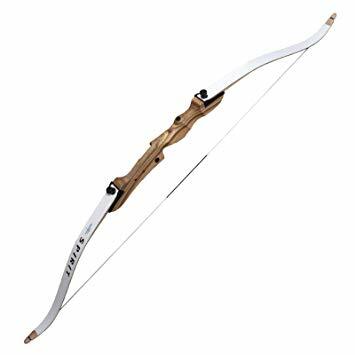 These woods are the strongest that can be found in Asia and used for making archery equipment, so it is commendable that this manufacturer uses them for making this recurve bow so sturdy. The recurve bow has 66 inches in length, and it is suitable, as shown earlier, for shooters less than six feet in height. It could be a good pick if you intend to teach your son or your daughter how to shoot a bow. You will find it particularly easy to handle for target practice, but, if you want the younger members of your family to accompany you when you go hunting, you will discover that it makes a good weapon for taking down prey, just as well. You will find this model available in various draw weights that go from 22lbs to 34lbs. Depending on the skill and the frame of the shooter, you will be able to choose one that’s suitable. Another good thing about it is that it comes in both left-handed and right-handed versions, so you will have no troubles getting the right one. The Southland Archery Supply SAS Spirit is a takedown bow, which means that it will require some assembly. However, you are provided with all the hardware and tools needed for this operation, as well as a manual. Although, it must be mentioned that clear instructions on how to put together the bow are not supplied, which is a downside for a bow that is, otherwise, easy to use. Luckily, most takedown recurve bows are the same, so learning how to assemble one means that you’ll know how to assemble all. Apart from the details provided earlier, the recurve bow doesn’t come with any outstanding features. It must be mentioned that the manufacturer offers a limited warranty for three years, which might tell you something about how durable this bow is. The shooters who have already tried and tested this recurve bow do not have any complaints about the recurve bow making unnecessary noise. For a company that knows what to do to make recurve bows that are head and shoulders above the competition, that shouldn’t come as a big surprise. Approaching your prey without giving away your presence is essential, so it’s a good thing that this recurve bow doesn’t appear to be particularly noisy. Although the Southland Archery Supply SAS Spirit is a pretty straightforward option, without any bells and whistles, you will discover that it is good at what it does, which is, after all, the most critical aspect to consider. Its flexible and robust construction guarantees that you won’t have a problem with it for many years, which means that it is a sound investment. Especially if you are looking to spend little on a bow for your teenage son or daughter, this one meets all the criteria.